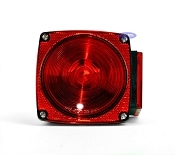 This is the Red Oval Incandescent light for your trailer. This light is sealed and can be submerged. It is a three function light meaning that it is a stop,turn,and tail light. If you've lost of damaged a6 1/2" Incandescent oval light, and still have the grommet, this light will mount snugly into the grommet and housing. The 3-Prong style wiring harness plugs into the back of the Incandescent light. This price is for one light. I originally ordered a pair of LED pipe lights, after installation one LED bulb was intermittently working. I called Sturdy Built and they quickly and without hassel sent me another bulb. After disassembling the Pipe Lights it turns out the plug was not inserted fully against the back of the LED bulb. I pushed the plug all the way on and everything works great and now I have a future replacement bulb I will hopefully never need. Ordered this part and it came on time and wrapped for protection. One flat head screwdriver, pop out the old lights, disconnect wiring harness, put new lights on and presto brand new lights for my trailer. Done in less than 3 minutes. No hassle, no fuss. Great service. Great lights. Will always buy from Sturdy Built. After 10 years, one of my my original Pipe Light lens covers became unglued and fell off. I did not want to buy a new kit and spent considerable time finding a lower cost alternative fix for my boat trailer. This was the exact light to make the replacement. Took a minute to plug it in and work the new light through the original grommet.